The Academia Militar das Agulhas Negras (English: Agulhas Negras Military Academy - named after the Agulhas Negras summit; AMAN) is the biggest among several schools of formation of combatant officers of the Brazilian Army. It originated in 1792 with the creation of the Royal Academy of Artillery, Fortification and Drawing - first military school of the Americas - in the city of Rio de Janeiro. Today the Academy is located in the city of Resende, in the state of Rio de Janeiro. In 1792, Queen Mary I of Portugal and Brazil founded the Real Academia de Artilharia, Fortificação e Desenho (Royal Academy of Artillery, Fortification and Drawing) in Rio de Janeiro, modeled after the similar existing Academy in Lisbon, intended to the train the artillery and engineering officers of the Portuguese Army in Brazil. This Academy is considered the pioneer of the military and engineering education in the Americas. The transfer of the Portuguese Royal Court from Lisbon to Rio de Janeiro in 1808 caused King Dom João VI to inaugurate on 23 April 1811 the Real Academia Militar (Royal Military Academy), incorporating the previous Royal Academy of Artillery, Fortification and Drawing. Its first location was at the Train's House of the Artillery, today the location of the National Historical Museum of Brazil. 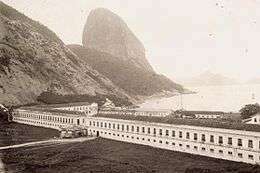 Military Academy in Rio de Janeiro, 1888. In 1812, the Train's House was transferred to the São Francisco square, a place that offered better conditions for warfare maneuvers. With the Independence of Brazil in 1822, it was renamed the Imperal Academia Militar (Imperial Military Academy). With the ever-growing need to improve the training of the officers of the Brazilian Army, it was merged with the School of War in Porto Alegre, Rio Grande Do Sul. In 1913, with the objective of uniting all the military institutes of War and Application, was created the Military Academy. With the urgent need to expand its facilities to absorb an Army that grew and got operational was created, on January 1, 1944 in the city of Resende, the Military School of Resende. It was renamed the Academia Militar das Agulhas Negras in 1951. The AMAN campus in Resende occupies 67 km². It contains several complexes, including the Main Complex, the Physical Education Department, the Equestrian Department, the Firearms Department and the Instruction Park. The Main Complex was expanded in 1988 to two times its original size, the expansion consisting mainly of refectories and cadets' lodgings. The Command and Services Battalion includes the Headquarters Company, a Service Company, a Military Police Company, a Guard Company, a Rifleman Company, and two Corps of Cadets Auxiliary Companies. It is the largest Battalion of the Brazilian Army. The Cadet corps are constituted by a Commander, a Deputy Commander, a staff and diverse Courses and peculiar Sections, composites for Officers and Cadets with the diverse missions and characteristics. Specialties include infantry, cavalry, artillery, combat engineering, communications, quartermaster, and ordnance. Cadets receive training in riding, weaponry, and physical fitness. AMAN Cadets during the "Small Sword" ceremony. A cadet's career begins at the Preparatory School of the Brazilian Army (Escola Preparatória de Cadetes do Exército), where they made the first year of military studies. Later, they should go to the Academy where takes place another year of basic formation. The next period, qualification, takes up from the second to the fourth year. In the first period, the cadet's personality is adjusted to military life and combat. The cadet undergoes physical qualification and training in various abilities. During the second period, the cadet practices command, continues with physical training and develop to meet the positions and functions of subordinate officer and captain. Other activities include maneuvers, the Academic Olympics, sporting competitions against the Naval School and the Academy of the Air Force (NAVAMAER) and the South American Festival of Cadets. Luís Alves de Lima e Silva, Duke of Caxias - Brazilian's Army Protector and Prime Minister of Brazil. José Paranhos, Viscount of Rio Branco - Prime Minister of Brazil. Alfredo d'Escragnolle Taunay, Viscount of Taunay - Brazilian aristocrat, military officer and writer. Deodoro da Fonseca - Marshal and President of Brazil. Floriano Peixoto - Marshal and President of Brazil. Hermes Rodrigues da Fonseca - Marshal and President of Brazil. Eurico Gaspar Dutra - Marshal, President of Brazil and Minister of War during World War II. Humberto de Alencar Castelo Branco - Marshal and President of Brazil. Artur da Costa e Silva - Marshal and President of Brazil. Emílio Garrastazu Médici - General and President of Brazil. Alacid Nunes – Governor of Pará (1966–1971, 1979–1983). Ernesto Geisel - General and President of Brazil. João Baptista de Oliveira Figueiredo - President of Brazil, previous chief of the National Intelligence Service of Brazil. Golbery do Couto e Silva - General and founder of the National Intelligence Service of Brazil (SNI). Enzo Martins Peri - General of the Army, former Brazilian Army commander. Eduardo Dias da Costa Villas Bôas - General of the Army, Brazilian Army commander. Floriano Peixoto Vieira Neto - Major General, former Commander of the United Nations Stabilization Mission in Haiti (MINUSTAH). Duke of Caxias, AMAN cadets swear the following oath: "I receive the saber of Caxias as the symbol of military honor itself." Marshal Jose Pessoa Cavalcanti de Albuquerque, nephew of president Epitácio Pessoa. He was responsible for the modern campus in 1944. 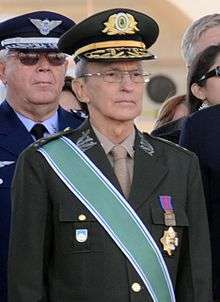 General Enzo Martins Peri, former Brazilian Army commander. He entered the Agulhas Negras Military Academy in 1960. Building where the Royal Academy of Artillery, Blockhouse and Drawing was founded in 1792 by Queen Mary I of Portugal in Rio de Janeiro. President Lula da Silva, the Minister of Defence Waldir Pires, Senator Rebelo and Generals listen to a speech by a cadet in 2006. President Lula da Silva delivering a small replica of the saber of the Duke of Caxias to a cadet in 2006. President Lula da Silva and the Minister of Defence Nelson Jobim delivering a sword during a graduation. ↑ "Ex-governador Alacid Nunes é sepultado em Belém". G1 (Rede Globo). 2015-09-07. Retrieved 2015-10-03. "Academia Militar das Agulhas Negras" (in Portuguese). Brazilian Army. 2008-03-11. Retrieved 2008-03-11.